Dr. Tom and a handful of nurses and orderlies have weathered many storms and hardships. They’ve made do with very little in the way of supplies and facilities. They do their best to ease suffering and save lives in this seemingly God- forsaken place. Recently, I learned that we have a $100,000 MATCHING GIFT CHALLENGE in support of Dr. Tom and our Mother of Mercy Hospital. ...So when you give $500 in response to this appeal it will be worth $1000...your gift of $750 will be worth $1500...your gift of $1000 will be worth $2000...and so on up to $100,000 to provide Dr. Tom with the food, medicines and supplies he so desperately needs. 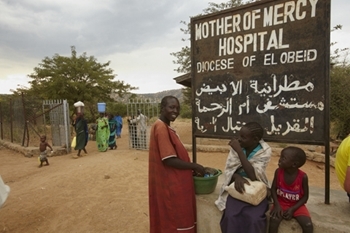 For more than six years, this Catholic hospital ― that you and other Sudan Relief Fund donors helped to build ― has been a place of life and hope in this region where war and extreme poverty reign. It’s been a place of healing in a land of sickness and war. It’s been a place of hope ... a place where lifesaving surgeries are performed and wounds healed. It’s a place where mothers and babies who otherwise would die in childbirth live. 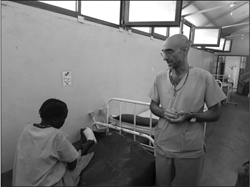 At the Mother of Mercy Hospital Dr. Tom encounters maimed and wounded villagers day in and day out. He sees starving children, deadly dysentery, cholera, TB and malaria. Dr. Tom is treating burns and binding wounds when he can, and amputating limbs when he must. Men, women and children are starved, maimed and driven out of their homes into caves and refugee camps. But Dr. Tom and his small, overworked staff do save lives and heal hearts here against all odds. It’s been three years since the radical Arab Muslim regime in north Sudan unleashed a new campaign of genocide against the peaceful people of the Nuba Mountains. This brutality has resulted in mass starvation and the displacement of hundreds of thousands of innocent people. I know that the Nuba Mountains and my diocese of Tombura–Yambio in South Sudan are vastly different from the world in which you live. Here people are literally starving to death. And they die of preventable and treatable diseases and infections. The times have always been difficult here. But now with the bombings and the severe famine ... things are much, much worse. Food and medicines are in dangerously short supply! In fact, until I received news of this $100,000 Matching Gift Challenge, I didn’t know how we were going to feed so many starving people. I didn’t know how we were going to get Dr. Tom the medicines and basic supplies he so desperately needs. But now ― dare I hope that we can raise $100,000 from donors like you and then add the $100,000 matching gift for a total of $200,000? I pray God will move your heart and that you’ll give as much as you can today ― when your gift will be doubled and do twice as much good for your brothers and sisters here. God sent us this $100,000 matching gift so that TOGETHER we could feed the hungry and heal the sick at Mother of Mercy Hospital. Will YOU help? Will you love the suffering people of Sudan and be the face of Christ and give hope to a people most of the world has chosen to ignore? Together, we’ll reach out to Dr. Tom and the patients and staff of the Mother of Mercy Hospital to feed them, encourage them, and give them hope in His Holy name. Thank you and God bless you for your faith, compassion and boundless generosity. 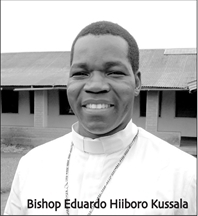 Yes, I want to join Bishop Kussala and the SRF in The Mother of Mercy Challege Grant, where each donation I give is automatically doubled! The Sudan Relief Fund is a 501(c)(3) not-for-profit organization. Your gift is tax-deductible to the full extent of the law. Everything you give, is doubled, and goes directly to The Mother of Mercy Hospital! The Sudan Relief Fund is a 501(c)(3)not-for-profit organization. Your personal or corporate contribution is deductible to the full extent of the law.